Here at Lakeline Vision Source, our Cedar Park eye doctors offer one of the best methods for evaluating your intraocular pressure. 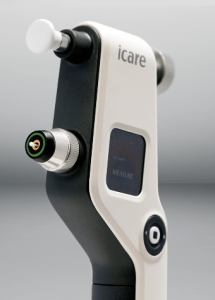 The iCare Tonometer is an extremely advanced piece of technology that can measure the pressure within the eye with absolutely no eye drops and no ‘puff of air’. The iCare tonometer is based on unique, patented rebound technology, in which a very light and small probe is used to make a momentary contact with the cornea. The quick and painless measurement is barely noticed by the patient and any anaesthesia or inconvenient air puffs are not needed at all.